The U.S. Environmental Protection Agency on Saturday kicked off a new cleanup effort at a West Oakland Superfund site once used by the AMCO Chemical Corp., according to EPA officials. Since 1997, the EPA has been working to remove industrial chemicals such as trichloroethylene (TCE) and vinyl chloride from the site, located at 1414 Third St., about a block south of the West Oakland BART station. The lot was used by AMCO as a chemical distribution facility from 1960 to 1989. The EPA on Saturday launched a roughly $10 million effort to remove contaminants from the soil and groundwater using a system of 69 underground electrodes to heat the water and earth to 212 degrees Fahrenheit. 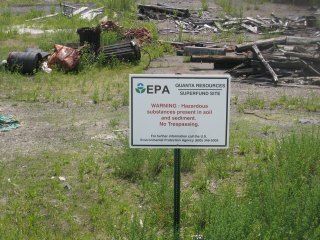 The vaporized pollutants are then captured and removed from the site for safe disposal, according to EPA officials. "Starting up the treatment system marks another step toward a healthier, cleaner neighborhood for West Oakland," EPA Acting Regional Administrator Alexis Strauss said in a written statement. "I applaud the many community members who have been engaged in and committed to the cleanup work that has taken place here over the years." The site, which sits on about an acre of land, was home to several bulk chemical storage facilities, including 12 aboveground tanks and two underground tanks. Worry about the contaminants surfaced in 1995, when utility workers unearthed strong chemical odors while excavating in the area. Soon after, testing revealed vinyl chloride and other industrial solvents in the soil and groundwater, according to the EPA. In 1996, the California Department of Toxic Substances Control asked the EPA for cleanup assistance. Several artists continue to use the warehouse at the site, which is also close to homes and business. To ensure the cleanup won't pose a public heath hazard, the EPA will continuously monitor air quality in and around the site during the project, which is expected to wrap up by the end of 2017. Additional information about the site can be found here.